You don’t wake up one morning and decide to become an evangelist. It’s an organic progression that stems from emotion and something more, something deeper. An energy grows within until it reaches the limits of containment and pours out of you. Everything you say and do is unconsciously linked to the energy. Even if you wanted to shackle it — and you don’t — you couldn’t. What started out as a personal decision has become an entity of its own. And the entity catches other eyes through you. It beckons to other people in your life. The line between religion and fly fishing is barely there anyway, and this is most obvious when it comes to proselytizing. I don’t ever start a conversation with the intent of making a convert, but it happens before I know it. The discussion will turn to fly fishing — as all my conversations inevitably seem to do these days — and whomever I’m talking to will say, “I’ve never tried that” or “I’d like to try that” or “what’s that all about.” In the blink of an eye I’m shuffling through the back room or opening a truck door looking for the fly rod and placing it in a potential disciple’s hand. More questions bubble out as they wave the limber stick, and I suggest a few casts. “Right here? Don’t we need water?” they exclaim. “Water is just one component of fly fishing,” I say. Fish are, of course the second. Water and fish are important, sure, but water and fish are part of every angling experience. 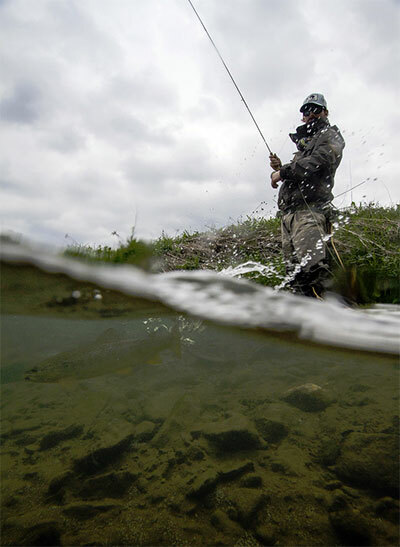 The essence of fly fishing is fully realized within a treble of elements, but the third is not easily explained. So I rig the rod, passing line through guides, and tie a piece of yarn to the leader for a full fly casting simulation. And then they cast the line. It’s always rough at first. A lifetime of chucking lead, cork floats and weighted lures leaves them unprepared for the mechanics involved in casting line. I offer instruction from my limited experience and they soon learn to feel the subtle surge of weighted line on the backcast that signals them to start a tender acceleration forward. Vertical halos loop over their heads with increased regularity. Eyes widen. Without exception, an ethereal change in countenance sweeps across their face as the flow of energy radiates from arm to rod to line and back again. Everyone smiles. What I tried, unsuccessfully, to put into words as I talked about the reasons I’m a fly angler no longer needs words. They get it. And while I haven’t kept track of actual conversion percentages, my tally does include at least three newcomers to the sport in only the last few months. One young man bought a fly rod mere hours after catching his first smallmouth on my fly rod that very morning. I had to nearly threaten bodily harm and wrestle it away from him when it was time to leave the creek. Even those that have not bought their own fly rod yet say they love it. Maybe not those words verbatim (thought two did) but they, too, struggle for accurate phrasing when I ask why. “This is cool” or “I see why you’re so into this” or sometimes just “wow” is what I hear. Everyone vows to do it again and several have asked to join me on a fishing trip. I know some of the promises are just lip service. Even if the experience moves something in their soul, the way of the disciple requires, well, discipline. Emotions and gut feelings offer only an invitation. It takes effort to enjoy the full benefits and sense of harmony in any walk of spirituality. Faith without works is dead. And all of this happens without my conscious decision to make it happen so I am an evangelist. I’m a soggy, creek-wading evangelist that found a less-traveled path by accident and I want nothing except to spread the good news — there is a better way. The better way has provided a closer relationship and understanding of my home waters and its denizens, and it offers something else that words just can’t quite describe. But instead of trying to explain, let me grab a fly rod and you can give it try.